As you may have noticed from my previous reviews of romance novels, I'm not big on them. A lot have formulaic Harlequin feels to them. You know, there's a damsel in distress who lives in (fill in the blank), works as a (fill in the blank) and hates, but falls in love with her (fill in the blank). The names, locations and occupations change, but the story line is always the same. I have a cousin that reads Harlequins constantly and I'm just amazed because the covers and characters are the same no matter what they or the book is called. 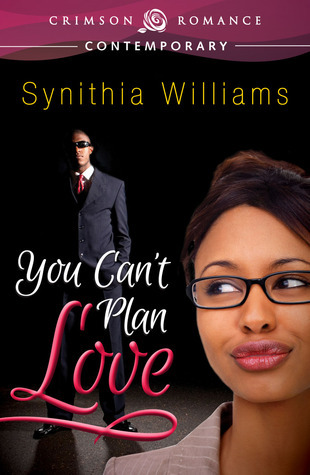 So I was pleasantly surprised when I read Synithia Williams' You Can't Plan Love. Kenyatta Copeland is a capable leading lady. As an environmental engineer in a male dominated field, she's learned to hold her own. She loves her job and where her career is heading. According to her mother and friends, it's about time she gets married and whom better to marry than Brad Johnson? An accomplished attorney, Brad is the man of any woman's dreams, except Kenyatta's. She doesn't feel the passion for him that she should, but she knows he'll be a good provider and she'll eventually learn to love him. But...and there's always a but, Brad wants her to quit her job when they get married. Quitting her job would mean giving up something she loves and losing her identity. It would also mean giving up Malcolm, her boss. While we can clearly see what Kenyatta is supposed to look like from the cover, Malcolm is in the background and not so easy to see. 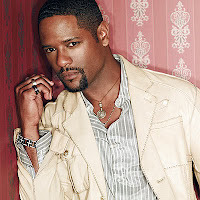 So in my mind, he looks like Blair Underwood. Let me have my fantasy! Anywho, Malcolm appreciates Kenyatta's mind and the way it works, among other things. But lest you think this is one of those books where he silently smolders with passion for her (I've read too many romances lately. I'm writing like a Harlequin author! ), he's very vocal about how he feels about her. Synithia Williams could have taken the tried and true road with You Can't Plan Love, but she's done so much more with it. If you're like me and you don't particularly care for romances, I recommend you give this a try. I think you'll be pleasantly surprised from the start to spectacular finish.